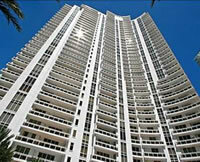 Brickell Key Real EstateContact Us Now! Brickell Key is a man-made island at the entrance of the Miami River that has been mostly developed by Swire Properties, the real estate division of a large Hong Kong and London based conglomerate. Brickell Key, located at the mouth of the Miami River is mostly waterfront condominium buildings with bayfront condos. This 44-acre gated enclave is a city within a city with 10 condominium towers; over 2,000 residences, five-star luxury hotel, twin corporate office buildings, and a bustling street side marketplace. The proximity to Brickell Avenue, the financial district of Miami, with its offices and restaurants, downtown Miami, the shopping and entertainment area of Mary Brickell Village, and the easy access to major highways make Brickell Key a fantastic choice for those looking for luxury waterfront condos in Brickell Key.